The U.S. needs to demonstrate leadership on dealing with the North’s gulags and other atrocities. Recent North Korean military provocations come out of its tested escalation playbook, demonstrating asymmetric capabilities and distracting its inhabitants and the world from the horrors within. In 2008, I was fortunate enough to accompany North Korean concentration camp survivor Shin Dong-hyuk on his first visit to the U.S. Holocaust Memorial Museum. It was surreal to witness the juxtaposition of images of mutilated bodies and to see the torture burns and scars in the flesh. He remarked through translation that the North Korean camps would hopefully never reach the point of mass extermination. Though I had visited the museum before, what struck me that day were the panels on why the Allies never bombed Auschwitz. Proponents presumably left no stone unturned in their effort to stop the slaughter. Disparate contexts notwithstanding, some similarities exist between the Holocaust and North Korea. According to North Korea watchers B.R. Myers and Charles Armstrong, North Korea actually reflects nationalistic fascism as opposed to Stalinist communism. 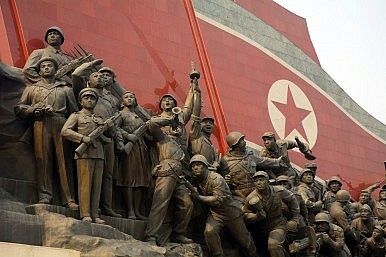 Additionally, a February 2014 UN Commission of Inquiry on Human Rights in North Korea report states: “The gravity, scale and nature of these violations reveal a State that does not have any parallel in the contemporary world.” Commission chairman Michael Kirby reportedly claimed that North Korean atrocities are “strikingly similar” to the Holocaust. The UN General Assembly has regularly passed resolutions condemning North Korea. There have been calls to refer North Korea to the International Criminal Court, but multilateral institutions may yield little progress even if a UN Security Council veto is somehow avoided (with an eventual end-goal of Chapter VII resolution). Still, international attention imparts credibility and momentum to the issue, although that is of little solace for the oppressed and dead. It is important to note that the Holocaust Museum has long brought crucial awareness to genocide issues – more public awareness helps to increase accountability for political leadership to act. The “Confront” section of its website lists Burma, the Central African Republic, the Democratic Republic of Congo, Khmer Rouge, Rwanda, the former Yugoslavia, Sudan, Syria, and contemporary Antisemitism. In my memory North Korea has never appeared on this list. Is it because North Korean atrocities cannot be categorized as genocide under its constricted legal definition? Perhaps, though some have maintained that forced abortions of mixed-race children (resulting from China’s trafficking and forced repatriation) amount to systematic infanticide. Others point to the targeting of Christians. Another reason why North Korean atrocities do not qualify may be political expediency (the sort of logic that applies to the Armenian genocide and not offending Turkey). One can only speculate as to the exact nature of the relationship between the Holocaust Museum and official government policy, apart from appointments. But the reason for the North Korea omission may have to do with denuclearization talks, during which human rights concerns have been sidelined as a nominal policy priority. Returning to the question: Should we bomb concentration camps? If conditions in North Korea are so bad that there is a rare international consensus, so bad that Kirby sees similarities to the Holocaust, so bad that survivors come out with mutilated limbs, then is this such an absurd question? Granted, bombing would not be prudent. But if concentration camps are such a moral outrage then why at the very least is the U.S. not demonstrating effective leadership on the issue? If not now then when will human rights be a policy priority? One way forward is to impose targeted financial sanctions for human rights violations, based on the efficacy of the 2005 Banco Delta Asia sanctions. Another policy reform is for a U.S. administration to actually implement the law through the 2004 North Korean Human Rights Act (NKHRA), which was reauthorized through 2017. Ideally NKHRA could have real teeth and increased funding (e.g., expanded radio broadcasts, cell phones, USB flash drives, graphic novels) to accomplish what it was designed to do: Promote human rights by empowering nascent citizen-dissent, civil society institutions, and the defector community, as well as increasing the number of refugees resettled in the US. NKHRA can also ensure that the Special Envoy for North Korean Human Rights be included in all talks as a mandatory Helsinki basket of negotiations. Unfortunately there does not seem to be a requisite senior administration official or Congressperson willing to champion the cause. The writer is an MA candidate at the Johns Hopkins School of Advanced International Studies. He previously worked for the nonprofit Liberty in North Korea from 2007 to 2009.